This time of year, I love walking through a near-by neighborhood full of "tree balls". I'm not sure if this idea originated here, but it is a really big tradition here now. I couldn't hold the camera still enough for really good pictures, but I hope you can get the idea. All these lights are balls, mostly 24 inch diameter or so hanging in trees. Some of these streets have hundreds, if not thousands, of them. Besides the beauty, I love the sheer dedication of these people. They had to MAKE all of these since the commercially available ones are way too small. I think this blog http://www.lightedchristmasballs.blogspot.com/ belongs to the family that started the tradition. They have lots better pictures and some interesting reading, including instructions on making and hanging the balls. Before there were tree balls, there was Mr. True and his little tiny house with a bazillion lights on it, just around the corner from where I live. Cars used to line up to drive by, like they clog the tree ball streets now. Mr. True was known as the "Santa of Chapman Street", and dressed as Santa and gave candy to all the children who came by. Mr. True passed away a few years ago, but his sons keep up the lighting tradition, though the Nativity scene and the rooftop sleigh seem to be missing this year. 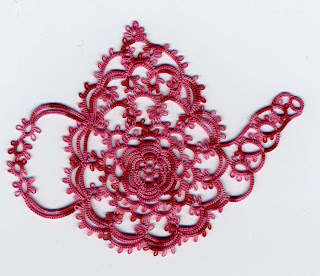 You would think from this blog lately that there hasn't been much tatting going on. Actually, I have been hard at work making ornaments to give the girls at work. This is a group of Jane Eborall's Sequin Snowflakes. All those messy strings are the hanging loops sticking in all directions. I personally prefer the second, heavily beaded version off the pattern, but I needed the simpler version to get it done in time. Jane has so many great tips for adding beads as you go, which allows for maximum creativity with minimum premeditation, which is great for working at home. For this project, I strung all the beads ahead of time, so I could slip a couple shuttles in my pocket and I was all set to tat on the bus, during my coffee break, and any spare moment. This one is Mike Meloy's snowflake. This is a quite nice one round snowflake - it works up fairly quickly, but has plenty of visual interest. In size 20 thread, it fits the bangle bracelets. Maybe a good idea for next year's giveaway. Remember my post about the package from Ireland? Pamela hastened to tell me that it wasn't a wait-till-Christmas-Day type package. Luckily, the post was running ahead of schedule, so there was still plenty of oxygen left, and tragedy was averted. This is Danny, one of Pamela's magic creations. I wish you could see all the details and the tiny stitches. And there was a skein of Rainbow Bright too. I am so lucky. Danny has been exploring his new digs, with much head-shaking at the dust and clutter. Here he is, climbing in the closet shelves. Is he looking for a storage place for his thread, or hoping to add to his own stash? I think I had better keep an eye on him. I enjoy lurking at http://groups.yahoo.com/group/amigurumi. 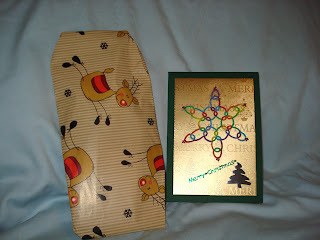 Today's post is a thank you and Merry Christmas for those nice folks there (and anyone else who crochets). You may make copies for yourself and a few friends, you may make, give, or sell the item, but you may not reprint or repost the pattern elsewhere without permission. Body: Do not join at ends of rounds, work continuously, marking ends of rounds. The eyes are French knots, easiest to work a little while after the ears have been made. Stuff with fiberfill as the opening grows smaller. Rnd 22: [2 sc in sc, sc in next 12 sc] 3 times (42 sc). Rnd 29: decrease 6 times, sl st in 1st stitch and end off, leaving a few inches of thread. Sew closed. Rnd 8: working in back loops, decrease 6 times, sl st in 1st stitch and end off, leaving a few inches of thread. Sew closed. Completed Front Leg. The large round upper sections of the legs are sewn to the body to form shoulders and hips. Row 4: sc in sc. End off. Sew legs to body using whip stitch and stuffing lightly as you go. It is easiest to sew the upper flat parts first. Sew tail to behind. Row 2-22: Ch 3, dc in next 2 dc. End off. Make fringe with white yarn. Row 5: Ch 3, decrease, dc in dc, decrease, sl st to top of Ch 3, end off. Ch 3, dc in same ch, [dc in next ch, 2 dc in next ch] 5 times, dc in next ch, sl st to top of Ch 3, end off. Fold white row upward. Sew white pom-pom to point of hat. A surprise has arrived all the way from County Cork, Ireland. Oooooh, what can it be? Pamela has also enclosed a pretty card bearing one of her Tumbling Snowflakes, worked in her own Rainbow Bright hand dyed thread. This thread is just as gorgeous in person as you would expect it to be from the many pictures of it I have seen. A special thank you to Pamela. These date back to the Palmetto convention in early September, and I apologize to the givers for not showing them off earlier. 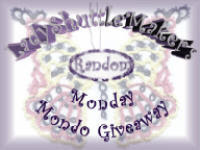 This is a butterfly given to me by Sherry Townsend. The pattern is from Tatted Animals by Inga Madsen, but Sherry has worked some of her special magic, experimenting with some two thread techniques. The scan doesn't do justice to the beads, which are very delicate and sparkly. The Palmetto guild treat their teachers like royalty. Lori Dunlap made bags for all the teachers with a heart motif, and heart edging all around. I was amazed with all the work she did. The bag is like a handkerchief bag, but larger. Pictured alongside are just a couple of the many other gifts. 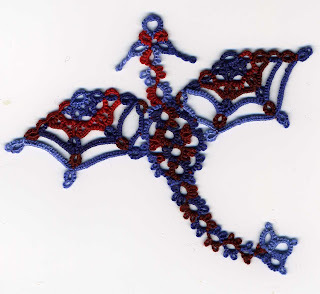 Update: this pattern is Regal Heart from Tatting Hearts by Teri Dusenbury. I didn't recognize it at first, but I should have. Both of the pattern books mentioned here are excellent. How many times have you bought a book for just one pattern? I have worked quite a few patterns from both of these, making them well worth having. 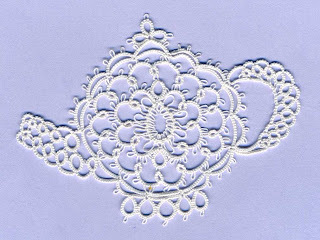 Here are two lovely Romanian Point Lace teapots from Gina Brummett. 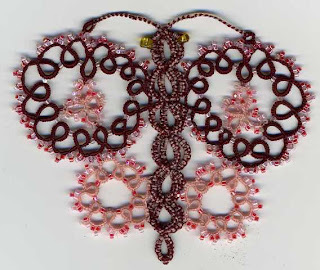 This form of lace combines needle lace and a crocheted braid. Though her nickname is the "Tatting Goddess", she is a lady of many talents and also makes other forms of lace, crochets, sews, paints, etc. I actually tatted something that wasn't ugly this week, but Shh!! it's a secret. I don't have any new tatting to show, since lately all I have are really ugly rough drafts, so I thought I would share some of the beautiful things I have been fortunate enough to receive. These are two turtles by Tatbit Teri Dusenbury. 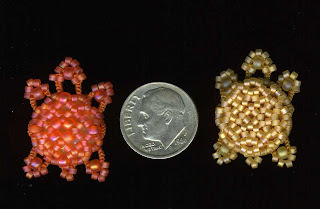 This is exquisite, meticulous work with all these tiny beads placed so perfectly. Please visit her blog, here. She is planning a new e-book of heart patterns, which I am very excited about. 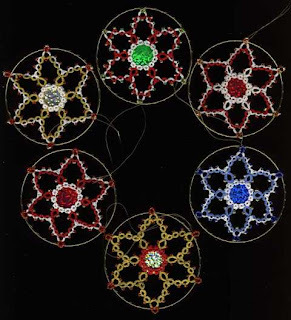 Her book, Tatting Hearts, from Dover Books was very influential for me, since I think it was my first "modern" pattern book, as compared to the reprints of earlier works which were all I had before. This book also introduced me to the split ring, which was a huge,revolutionary concept for me. You've heard me say that strange (craft related of course) ideas pop in my head. Most recently I got the notion to make Halloween jewelry. Yes, I am another one of those that love Halloween and I am munching on candy corn right now. Since I borrowed the shape from one of my other patterns, this one was fairly quick to design. I made up several and mailed most of them away. When someone would come sit next to me to see what dainty ladylike thing I was tatting today, it was funny to hold up a row of grinning skulls instead. DH helped model since I was having trouble with the camera one-handed. 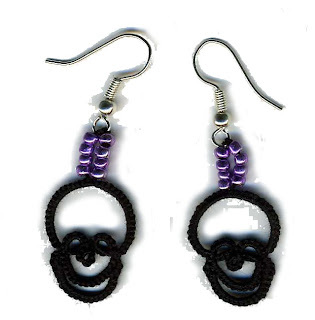 There are earrings too, but I forgot to model any before mailing away. I haven't made myself a pair yet since I'm still wearing the new ones I bought at the Ren Faire. Ooooh, had to come back later and add: the pattern is here. One day last weekend we got up, played the music of Blackmore's Night singing "The Renaissance Faire" to get in the mood, and indeed headed off to the Renaissance Faire held every fall just north of Charlotte NC. The weather was wonderful and the crowds less than usual. It runs every weekend through mid November, and I heartily recommend it to anyone within traveling distance. (The same company has a fair in Arizona in the spring.) It may not be historically authentic, but it is a whole lot of fun. There are live jousts, stage shows mostly comedy, lots of music, juggling, sword swallowing, magic, belly dancing, falconry, glass blowing, etc, etc. Many of the guests come in costume, and so did we, but I stupidly forgot to take pictures of the family. Our long time favorite act is Don Juan and Miguel, who have a comedy show which includes whip tricks and swordfights. My other favorite act is the Nun Show. These women are just roll on the ground funny. My favorite musical act is the Puckerbrush Players, a retired husband and wife who now tour the country playing hammer dulcimers. These are two of the nicest people you could hope to meet. I have all their CDs. Here are some other performers. Some advice for those that attend: If you buy your tickets ahead of time at Harris Teeter, you get a dollar off and you don't have to stand in line at the gate. Buying stuff. Items for sale range from cheesy souvenirs to exquisite jewelry, art, leather, sculpture, clothing, etc. Food. Food at the fair is pricey and often involves standing in long lines. We minimize food expense by eating at the McDonalds just before the fair. (Of course you can go to McDonalds in full costume, and if anyone asks if you are going to the fair, smile brightly and say "What Renaissance fair?") But we do always buy a big bag of cinnamon almonds--you simply must have some of those. Tips for performers. The performers will beg for tips at the end of the show. Other stuff. There are some rides and games that cost extra. Also face painting, hair braiding, etc. At the end of the day, there used to be a muscians' jam that I enjoyed a lot, but this has apparently dwindled down the last few years. There is also a closing ceremony at the front gate with the cast singing a song with their own made up verses and the firing of the cannon. We always have a great time. You could stay all day and not see it all. I can hardly believe it's been over a month since the Palmetto Tat-Days. That is my favorite place to go. I always have the best time getting together with old friends and making new ones. We have such a good time talking and laughing. 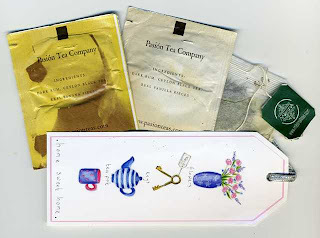 The Palmetto guild takes such good care of us, with the activities and the gifts and the food. Here are a handful of pictures so you can tell what fun we had. Here is another teapot, this one worked with King Tut quilting thread. I wish I had measured it or put something else in the picture to give an indication of size before I gave it away. It's probably 2 1/2" wide. This thread isn't quite as forgiving as the cordonette for retro-tatting, but it is still a great thread to work with. Tatting with tiny thread isn't as hard as you might think. (I remember my trepidation the first time I decided to try size 30 after learning how with size 10.) For these tiny threads, I need my reading glasses to count the stitches, but, heck, I need them for most "average" threads now too. Joining into a tiny space like a lock join requires a very small crochet hook, but for routine joins into picots, the hook on the Aero works fine. 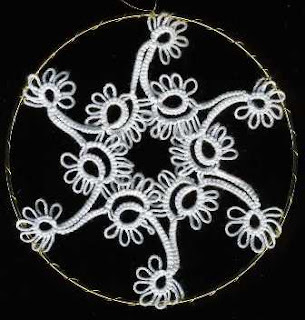 For making your tatting, you are working around the thread wound over your left hand, so that part is the same no matter what the thread size. 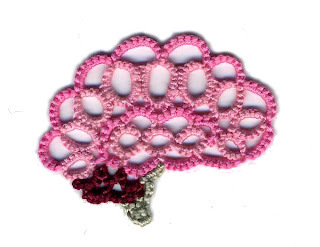 It's much easier than crochet with small thread, with trying to stick the hook into each tiny stitch. If you can work with size 30, you can probably work with size 70 too, and if you can work with that, then the size 100 and quilting threads shouldn't be any problem either. Try gradually stepping down in size and see what you can do. If you've been browsing blogs, you know this is probably the most popular pattern on the web right now. I think it's great too. This is by Anne Nuperelle. Her blog is here: http://nuperelle.blogspot.com/ and her website with the pattern is here: http://www.nuperelle.net/index.htm Thank you so much to Anne for sharing the pattern. I used two varigated size 8 pearl cottons. The color choice wasn't a complete success, but I've been wondering a long time how these threads would work together, and now I know. It took me nine tries to get this one right. Since I knew this would be the last one (no matter what), I worked it in size 100 thread just to see if I could. I went to bed that night (er, um, morning) a tired, but happy, tatter.